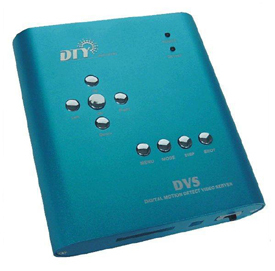 See More DVR's Here This miniature, portable DVR is very simple to use and can store approx 230 images & 50 (10 sec) AVI video clips with it's own built in 128MB of memory, up to a 2GB SD card can be inserted to increase memory capacity storage for up to 28800 images and 4380 (10 second) AVI video clips. The On-Board software includes motion detection recording triggers & time/date event stamping. Playback of stored video or still images can be viewed on a standard TV using the a/v output. Working Temp: -10 deg C~ +50 deg C.
Max Memory: supports 2GB SD Card. File Format: picture with JPEG, Video with AVI. Record Time: Motion detection, Every 10 seconds.